Searching for the missing link between the Beatles’ pop genius and Pavement’s warped brilliance? Look no further than Dr. Dog. Like those two bands, Dr. Dog creates an infectious atmosphere around their songs, imbuing each song with conviction and passion to draw the audience in. By the end, you might find yourself crooning along to their three-part harmonies and humming the melodies in your head on the ride home. The show opened with Cotton Jones, pitched somewhere between Bob Dylan and early Velvet Underground. The surreal and bittersweet lyrics soar perfectly over the miniature-orchestral backdrop. Michael Nau and Whitney McGraw have two of the prettiest, most dynamic voices working in the indie-folk genre today. Their songs incorporate unique flourishes, like xylophone, tuba, and electric autoharp. All of this makes for an ethereal yet earthy experience, akin to a backwoods church revival. Cotton Jones might just be a visionary band in the years to come, and you should be sure to check them out if given the chance. Suddenly, the house lights went down, leaving only black lights up on the stage. A Dr. Dog banner emitted a fluorescent glow across the stage. Demented, Main Street Electrical Parade-esque music blasted through the house speakers. Amidst the macabre darkness, Dr. Dog walked on stage and picked up their instruments. The band kicked things off with the Scott McMicken classic “The Rabbit, the Bat, and the Reindeer,” a jaunty piano driven song with beautiful harmonies. The multi-segmented song constantly changed directions without ever losing momentum. That such a warped song with such disparate elements (a main piano riff, harmonic guitar solos, and rhythm driven vocal sections) could conversely sound so natural is a testament to the bands honed approach to performance. The band switched gears with the more straight-ahead pop of “Stranger.” The song began with a cascading bass and guitar riff that lead the two guitarists and the bass player to dance gleefully around the stage. Toby Leaman sings this song, foreshadowing the raucous and impassioned vocal performances he would turn in for the rest of the night, really hitting the high notes at the end of each chorus with gusto. This song typifies a change in Dr. Dog’s music, toward more accessible or “radio-friendly” material. Not that they’ve forsaken feedback-oriented solos altogether, mind you; just that the band seems to be striving to make their signature sound larger than life on the last two albums. Accordingly, the majority of the selections they played were from the last two albums and featured anthemic choruses: “Do the Trick,” “Shame, Shame,” “Vampire,” and “Shadow People” all being textbook examples of this change in emphasis. These songs sound positively electric live, and will surely satisfy newcomers and old fans alike. Of course, the older material will always have a special place in my heart; and songs don’t come much more special than the elegant “From.” Here, the band leaves many of its contemporaries in the dust with their ability to perform beautiful three-part harmonies, knocking on the door of the Beach Boys with unabashed affection in their voices. Especially on the choruses, when McMicken’s voice soars into its upper register, your heart will melt. Eric Slick’s subtle drumming builds the song gradually over its duration, while still leaving headroom to erupt on the choruses. His restraint and melodic approach recall Ringo Starr’s underappreciated style, as his flourishes lead the song while sneakily tying everything together. Easily the highlight of the evening, though, was their ravenous rendition of “Lonesome.” The band quickly switched their line up: Leaman put down his bass to sing without playing, McMicken switched to acoustic guitar, and keyboardist Zach Miller played some slide on McMicken’s electric. Allowing Leaman to roam free like this was thrilling, as he prompted the audience to chant “Hey” during the verses and writhed around the stage. After an atonal slide solo, Leaman jumped into the audience to dance as he sang one final chorus with the crowd. Dr. Dog is a fun, interactive experience and not to be missed. Their tunes will move you, their show will excite you, and their personas will engage you. Their interesting blend of 60’s, 90’s, and current styles are sure to satisfy any audiophile in search of new classics. 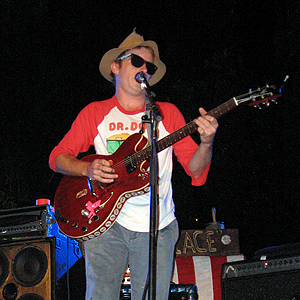 Dr. Dog is touring in support of Be the Void, released earlier this year, and tickets are available on livenation.com.